Kok Ten Have Publishers (Dutch). When Jesus was born the world was in ferment. Four great empires were undergoing the convulsions of globalisation. In the huge new multi-ethnic cities springing up across Europe, North Africa, the Middle East and Asia the traditions of family, village and tribe were being torn apart. Old allegiances were in flux: emperors struggled to create loyal subjects, merchants struggled to find their place in the new world order, the uprooted looked for new communities. They all turned to religion for the solution and the gods competed for their allegiance. This was a world rife with gods and messiahs, priests and warriors, elbowing their way around disrupted societies. 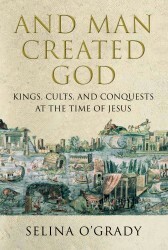 And Man Created God takes the reader on a dazzling geographical and intellectual journey across the evolving empires and kingdoms of the ancient world. Through superb evocations of individual rulers and holy men, O’Grady shows how emperors sought to shape religion to their ends, and how religion shaped emperors and their subjects. In Rome, Augustus was being turned into a god by his brilliant team of spin doctors. In what is now Sudan the plump warrior queen Amanirenas inspired her armies totrounce the Roman legions by exploiting her status as a god. And in China the usurper Wang Mangwon and lost the throne through his obsession with Confucianism’s magical reasoning. Messiahs, miracle workers, self-castrating priests, a wandering holy man – more famous than Jesus in his day, who brings a young girl back from the dead and turns water into wine … O’Grady introduces us to all of them in this riveting account of the interplay of faith and power at the time of Jesus. And she answers the most urgent question of them all: why the tiny Jesus cult triumphed over far more popular religious allegiances – to the goddess Isis, to the miracle worker Apollonius, even to the personality cult of Augustus – to become the world’s dominant religion. And Man Created God uncovers the ineradicable connection between politics and religion which still defines us in our own, not-so secular age. a masterful narrative, clearly told, with great panache, insight and humour. It should be required reading for anyone, Christian or otherwise, who has an interest in the historical context in which the "mystery cult of Yaweh" became one of the dominant forces in the world. In her sweeping account of relations between faith and power at the dawn of the Christian era, Selina O'Grady presents the political uses of pagan religion, set amid all the luxury and decadence of Roman life, with great relish and descriptive power... The result is an enjoyable, informative romp through the subject of comparative religion... With accomplished journalistic flair, she posits answers with far greater confidence than any academic, choking on footnotes, could muster. This is a dazzling, dizzying, compelling panorama of the world that Jesus knew and the worlds he had never heard of. Selina O'Grady shows us the overall map of what were really a series of interlocking but very distinct worlds... which come alive with her remarkable command of detail... It is a remarkable book... I cannot think of anyone who will not learn a huge amount from reading this book. expansive and intelligent... O'Grady's book should be read by both believers and non-believers in the open and inquiring spirit it exemplifies. O'Grady brings history to life.